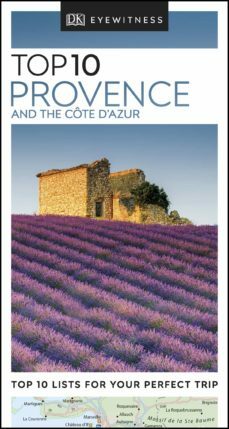 An unbeatable guide to Provence and the Côte dAzur, includes insider tips and ideas, colour maps, top 10 lists, all designed to help you see the very best of Provence and the Côte dAzur.Experience the sun-soaked beaches and riviera glamour of Saint-Tropez; kayak in the vast lagoons of the breathtaking Camargue wetlands; wander the streets of historic Vieux Nice; explore the museums of Marseille; or enjoy the nightlife in Cannes. From top 10 beaches to top 10 Roman sights, discover the best of Provence and the Côte dAzur with this easy-to-use travel guide.Inside Top 10 Provence and the Côte dAzur:- Ten easy-to-follow itineraries, perfect for a day trip, a weekend, or a week- Top 10 lists showcase the best attractions in Provence and the Côte dAzur, covering Palais des Papes, Gorges du Verdon, Roman Arles, and many more - In-depth area guides explore Provence and the Côte dAzurs most interesting neighbourhoods, with the best places for shopping, going out and sightseeing - Colour-coded chapters divided by area make it easy to find information quickly and plan your day - Essential travel tips, including our expert choices of where to stay, eat, shop and sightsee, plus useful transportation, visa and health information- Colour maps help you navigate with ease- Covers Marseille, Bouches-du-Rhône, the Var and Provençal Coast, Nice, Monaco, and the Riviera Staying for longer and looking for a more comprehensive guide to Provence and the Côte dAzur? Try our DK Eyewitness Travel Guide Provence & the Côte dAzur or our DK Eyewitness Travel Guide France.About DK Eyewitness Travel: DKs Top 10 guides take the work out of planning a short trip, with easy-to-read maps, tips and tours to inform and enrich your weekend trip or cultural break. DK is the worlds leading illustrated reference publisher, producing beautifully designed books for adults and children in more than 120 countries.